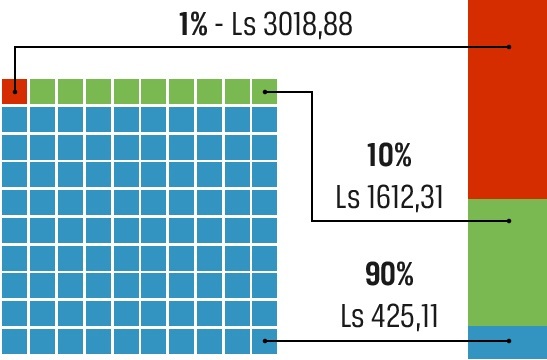 This chart shows the differences in income between the Top 1%, the Top 10% and the bottom 90% of Latvian society. The richest one percent earns seven times as much on average as the bottom 90%. These results are based on official sources, which cannot reflect Latvia’s large shadow economy (30% of the total), so the data may not be completely accurate. 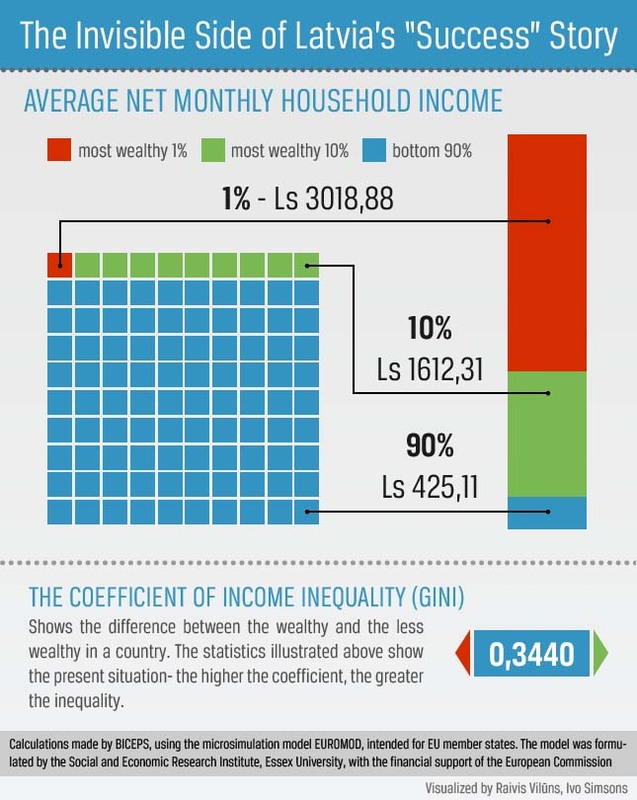 Latvia has the highest GINI coefficient and the highest income inequality in the European Union. Since the less wealthy cannot save as much as the wealthy and have fewer business advantages, the inequality in societies usually appears even more dramatic when measuring wealth. 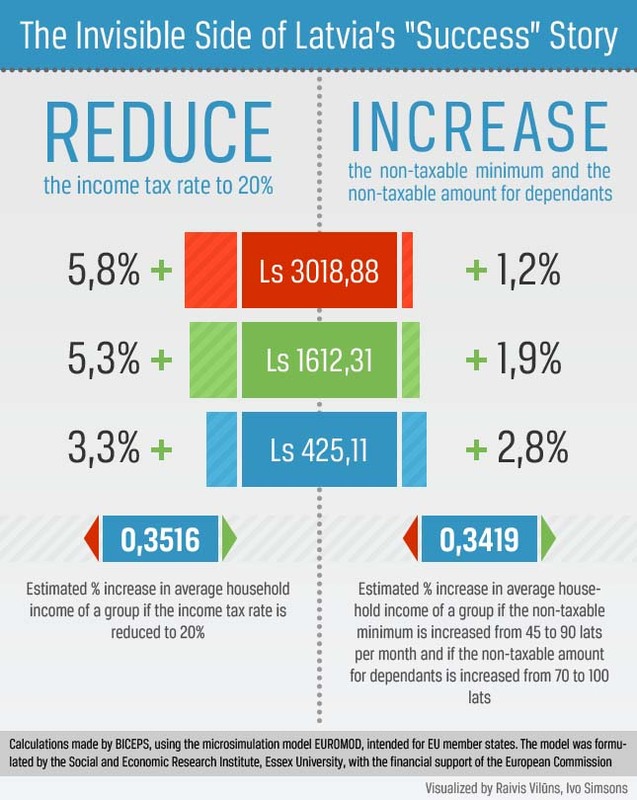 This graphic illustrates how the government’s tax changes will make Latvia an even more unequal society. The government had promised to increase the non-taxable minimum from 45 lats to 90 lats a month and to increase the additional non-taxable amount for those with dependants from 70 to 100 lats a month, as well as to reduce the individual income tax rate to 20% from 25%. In the end it chose only the cut in the income tax rate, which will benefit mainly the wealthy, and to a lesser extent, the middle income groups. As a result the GINI coefficient will go up significantly from 0,344 to 0,3516. This chart shows how the government’s tax changes will affect each quintile of household income. 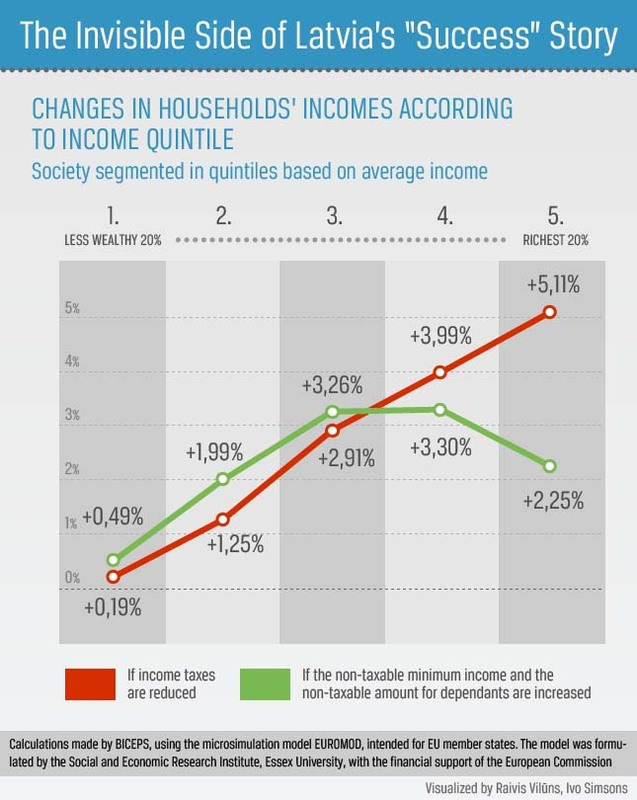 As shown by the red line, the poorest 20% of households will benefit hardly at all by the tax reductions, but the richest 20% of households will see their incomes rise over 5%. The proposed but rejected increases in the non-taxable minimum and in the additional non-taxable minimum for dependants would have benefited most in percentage terms the lower-middle to middle income groups. In any case, neither of the proposed tax changes would have significantly helped the very poor, who will instead be hurt by cuts to the Guaranteed Minimum Income (GMI) program. Up to now, this program was supposed to guarantee a minimum monthly income of 45 lats (64 euros) a month, but this amount will be reduced to 35 lats (50 euros) per month.